Has he agreed not to call Trump a "pathological liar"? Texas senator Ted Cruz will speak at the Republican National Convention later this month, despite the fact that Donald Trump threatened his wife and accused his father of being involved in the Kennedy assassination. According to CNN, Cruz met with the presumptive Republican nominee in Washington on Thursday. Afterward, he told reporters that Trump had offered him a speaking slot at the convention and he had accepted. The meeting, also attended by Republican National Committee chair Reince Priebus, Trump’s daughter, Ivanka, her husband, Jared Kushner, and Cruz’s former campaign chair, Jeff Roe, was one of a series of meetings Trump held with dozens of Republican senators on Thursday at the National Republican Senatorial Committee headquarters. 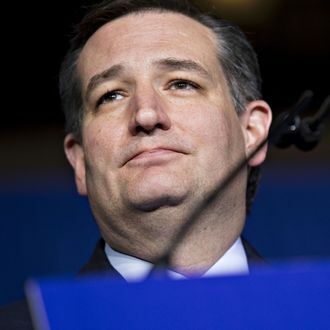 Cruz did not say, however, whether or when he would formally endorse Trump, telling reporters that they had not discussed an endorsement on Thursday. A Trump campaign official told CNN, however, that the two former rivals had agreed not to work against each other. If that is the case, they have managed to bury a very large hatchet. Emerging from the crowded GOP primary as the only two serious contenders, the two men had a series of nasty encounters in the last few months of the campaign, during which Cruz used a racy photo of Trump’s wife, Melania, in a sexist attack ad and Trump, in turn, threatened to “spill the beans” on Cruz’s wife, Heidi. The climax of their war of words came in early May, when Trump went so far as to suggest, based on a National Enquirer article, that Cruz’s father, Rafael, may have had a role in the assassination of President John F. Kennedy in 1963. Speaking of the Republican convention, Trump had said on Wednesday that the schedule for the event would be released the next day, but as of Thursday night, there is still no sign of it.